I make abstract work that connotes my experience. I use rhythmic analogues to evoke emotional reaction. 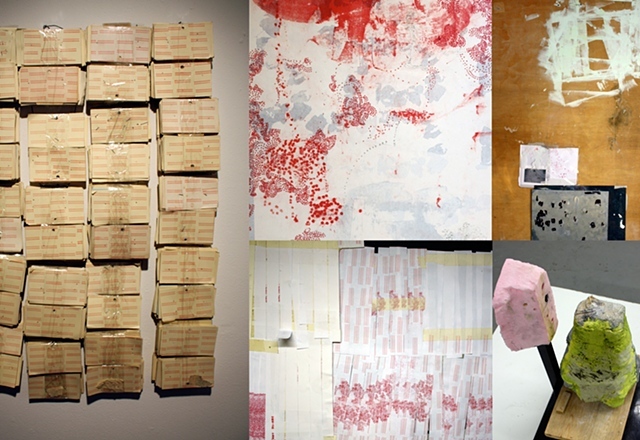 Spontaneous mark making, repetition of form, and their clustering are consistent elements throughout my work. I draw on comparisons between personal experiences and a variety of disparate sources, literary criticism, pop culture, indexical and naturally occurring forms, film, print, and photographic media. Despite the medium, my background in printmaking informs my approach to art making, the layering or collage of visual elements allows me to accentuate or negate information as I construct a piece. As a whole my work relies on relationships established through formal and material comparisons: paint vs. print, scrawl vs. type, found vs. handmade, immediate vs. restrained. I use a wide range of processes and materials to both contextualize elements and broaden my abstract language in an effort to increase the specificity of the formal and material choices I use to convey information.